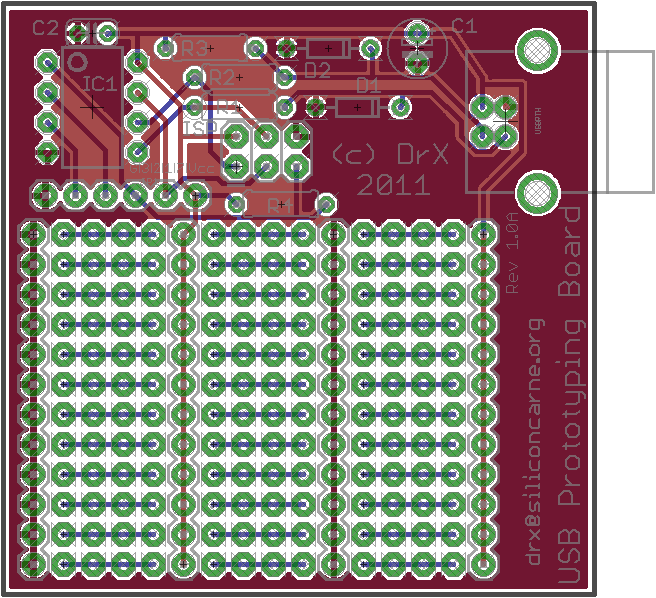 Zero Characters Left: USB prototyping board part 3: Would you like some PCB with that? USB prototyping board part 3: Would you like some PCB with that? 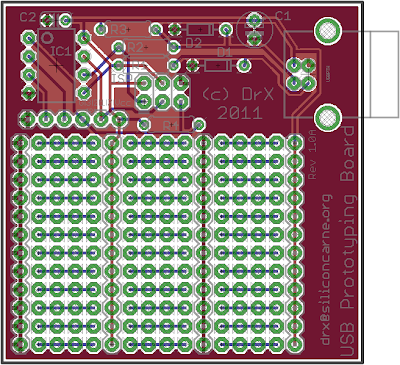 Here it is, my very first PCB design! The USB connector attaches on the top-right side. As you have have read on this blog, I wanted to make a PCB edge connector but the costs for the thicker board needed were an order of magnitude larger than the price of the connectors. The top of the board contains the USB logic. A largish prototype area -- with rails for power and ground, adorns the bottom part of the board. After the jump: getting started with PCB design, Eagle tips and some miscellaneous ranting. As I mentioned in the previous posts, one of the aims of this project is learning how to create printed circuit boards. One of the essential pieces of kit here is a good design tool. There are many many tools for creating printed circuit boards, some free, some Free and some commercial. The hobbyist world seems to run mainly on Eagle, so I decided to give it a try for this project. As a program, Eagle is a bit of a mixed bag. The interface is straight out of some UX designer's worst nightmare. It uses none of the standardized commands that computer users have learned to rely on in the past 15 years. It sports nearly identical icons for completely different operations. It's eccentric, to say the least. Like with any other specialized software suite, you don't get very far by just monkeying about. Thankfully I found these really great video tutorials by a guy called Jason from Virginia-based RPC Electronics that got me up to speed in about an hour. I am targetting a 5cm x 5cm board because I plan to use the cheapest option of seeed studio's Fusion PCB service. Note that 5cm is TINY. Resistors, DIP ICs and other assorted through-hole parts chew through board surface space like there's no tomorrow. No wonder they came up with that surface mount stuff. I know metric is the best thing ever, but if you plan to use DIP packages, just go ahead and use a mil/inch based grid. An inch is close to 25mm, but the errors accumulate quickly if the part has more than a few pins. The whole board will end up looking crooked and routing will be a pain as you'll have to go off-grid. Don't be afraid of the part/footprint editor. You will run into parts that are not in your library, or parts for which the footprint in the libraries available is just plain bad. Just take out the data sheet and make your own footprint. Experiment with placement and routing. Sometimes moving a component can dramatically simplify the entire board. Autorouting is really not as hot as it sounds. Pragmatic solutions are solutions too. I could not make a footprint for the entire prototype area because for some reason traces are not allowed in components. Instead I ended up dropping a whole bunch of custom components in the schematic and connecting them. It's not as neat and re-usable, but it solved this problem with just a few minutes of clicking. Is the board good? Does it contain irreparable hidden flaws? There's nothing left to do but wait for the delivery.